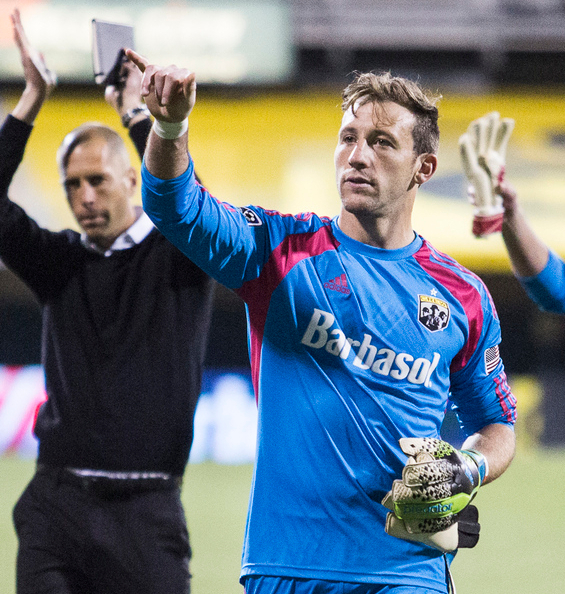 The Columbus Crew were able to avoid defeat with a goal in added time off good individual play from Wil Trapp and Hector Jimenez. As things got going the general feel of this one played out as expected before kickoff; Columbus holding most of the possession and DC being opportunistic. However, if you dig a little deeper and look at territorial possession you'll see that it was DC dictating the play while the Crew struggled to unlock the DC defense. What the chart on the left shows is how much each team was spending in each other's half. 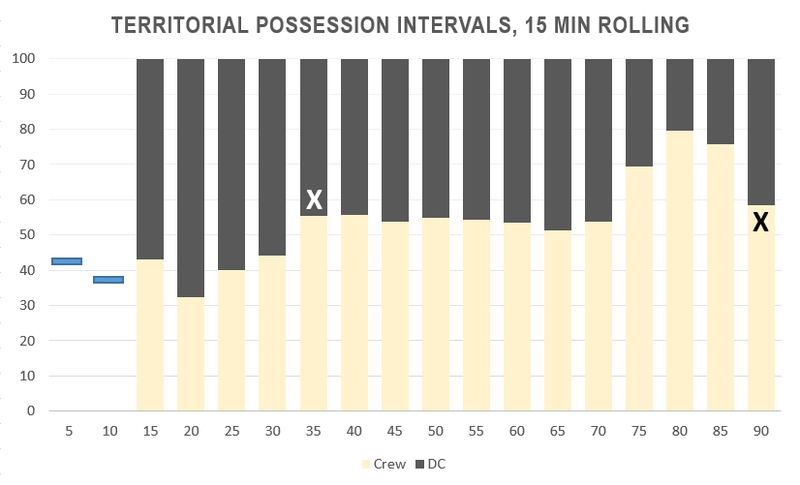 The Crew have dominated regular possession, passing and passing accuracy (which is where possession % is calculated) statistics all year but there is a good percentage of that done in their own half, working back into buildup play. The Crew were not pressing as hard this game and DC found space enough to work the ball around in attack. Eventually it burned them about 30 minutes in (marked with an "X" on the chart). You can see from the chart that DC, almost immediately, took the pedal off the gas and looked to keep Columbus in front of them. The Crew didn't exactly roar back but things did start to get testy on the pitch. There was a questionable call on Giancarlo Gonzalez that should have probably been a Red but he got yellow after he was beat by Eddie Johnson going to goal. After which there was a scrum in the penalty area that involved a number of players from both teams, nothing seemed too serious. Not long after Bernardo Anor was sent off for a two footed sliding tackle. Overall, it was actually a pretty drab half outside of that and both sets of players seemed to tire quickly as it continued on. The difference ended up being the little bit of extra fitness Wil Trapp had in dispossessing a gassed Espindola at the top of his own box, advancing to midfield unchallenged and firing off a perfect 40 yard pass to Hector Jimenez for a goal in the final moments. The Crew haven't looked the same with Dominic Oduro up top in this Berhalter system. It's now 1 win, 2 drawn and a loss (5 points from 4 games). On top of that, Oduro continues to be the only starter with a negative on pitch goal difference (it's now up to 2 GF, 4 GA). It's nothing that Dominic is doing wrong. The system just doesn't play to his strengths. This match was not one to remember for either team really. The ref certainly doesn't escape blame for that. His indecisiveness after the Gonzales tackle of Johnson was to blame for the handbags in the goalmouth. He should have given the red or the yellow and got the game going again. On that, not sure what has gotten into MLS play this year. Obscene amount of red cards issued, as well as penalties. There has been a definite change in policy this year in refereeing approach and it needs to get better. How? Going to be difficult as the precedent has been set. There is a lingering question for the Crew now; Is the change in attacking approach the Crew reverting back to bad habits from last year or have teams just sort of figured out what they are doing. Tough to say right now, but I do know that 1.25 PPG from last four is last year's team which means it looks like the Crew are in for a real grind next week vs. a desperate New York Red Bulls. First MLS Table of the Year!